I did a presentation on HDR a week ago for the folks at AMPP and one of the attendees, Michael Kendrick, and I were talking about how our passion for photography has changed our lives. It takes us places that we never would normally go, makes us look at things in a different way and sometimes just stop to smell the roses. Michael told me about some pics of boats that he had grabbed recently and that he had never thought of shooting where he did. He was driving his car over one of the bridges in the North Bay and spotted some worn and rusted boats and he felt compelled by his passion to pull over and grab his camera. It’s a feeling I get often and I’ve learned to listen to it more and more. Don’t get so wrapped up in your drive that you don’t see the world around you. Stop once in a while and take a look around. I don’t always have my Canon with me, but I’ve always got my cell phone to grab a quick pic and make a note for later, although there are moments when time is of the essence and if you don’t get the shot now, you’ll be hard pressed later to get it again. I’ve been yearning to get the iconic image of fog drifting over the Golden Gate with only the towers poking up through the thick white blanket of mist. Only one time have I been around there when the conditions seemed right and I had my camera, but the shot eluded me as I vowed to return in just a bit after meeting Paul on the other side in the Marin Headlands. Weather can change quickly here on the coast and by the time I was back, it was gone. Luckily, this tractor was not like that and I don’t think this old guy is going to be moving for a bit. I spotted it on the way into a winery during a day in Sonoma and it called to me as we approached the entrance making my head swim as I visualized the shot. We walked around the winery a bit and I grabbed some other shots first but I was eagerly awaiting our departure so that I could stop and get the shot that I was seeing in my head. I’ll be talking about previsualization and other techniques in an upcoming workshop on HDR photography. To get the latest info delivered directly to your inbox, sign up for the Anvil Image newsletter on the right hand side of the page. HDR Info: I shot 3 exposures for this image hand-held with my Canon 5d mkII through a Sigma 15-30mm lens @ 15mm/f11 with a base exposure of 1/160 second with ISO100. The 3 exposures were processed with Photomatix (use coupon code “Anvilimage” for 15% off) and spot corrected with layered exposure blending in Photoshop CS4. 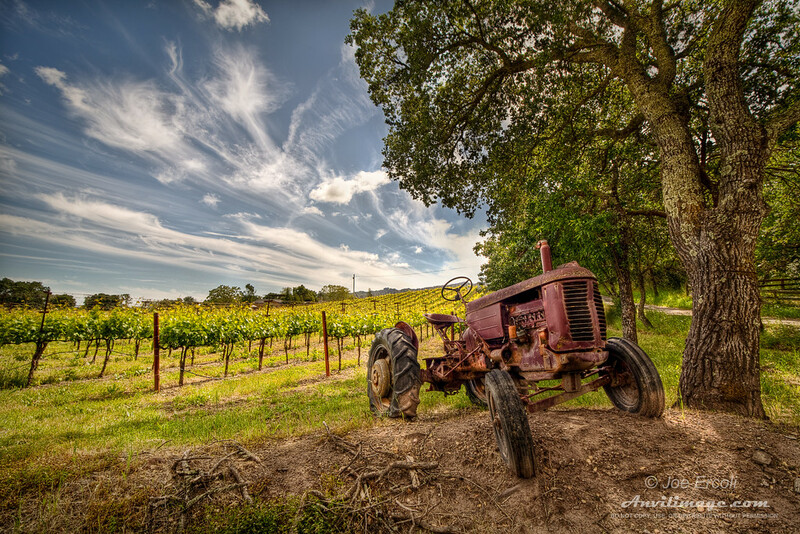 This entry was posted on Friday, June 11th, 2010 at 9:25 am	and is filed under Blog, Photos and tagged with HDR, passion, tractor, vineyard, wine, wine tasting, winery. You can follow any responses to this entry through the RSS 2.0 feed. I commented on this at DPS, but again, very nice job. Great processing as well. You managed to get a good range of light to dark everywhere without making the image flat — something I struggle with a lot. Wonderful! Wonderful…love the composition above everything else, but the HDR is fantastic. Saw it on HDR Spotting! Whoa, whoa, get out the way with that good inftmraoion.